If you didn’t know his name before, chances are you probably do now. 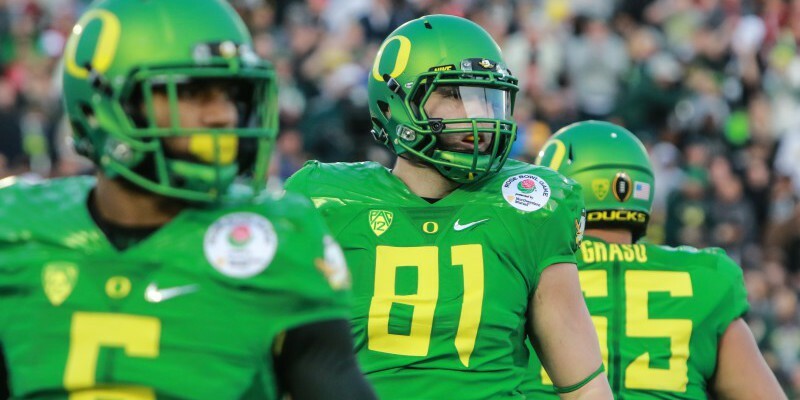 Evan Baylis, a redshirt sophomore tight end, was virtually unknown as this season began, but his Rose Bowl performance caught the attention of Duck fans. And as Oregon heads to the national title game against Ohio State, the previously unknown No. 81 might be more important than you think. After Pharaoh Brown went down with that horrible knee injury in the Utah game, many people questioned who would fill in at tight end. Brown was having his best season as a Duck, totaling 25 catches for 420 yards and six touchdowns on the year before the injury. The Oregon offense kept scoring, the Ducks kept winning, and the tight end position was all but forgotten. Baylis scored his only touchdown of the season against Colorado. Oregon has a history of playmaking tight ends: Dante Rosario, Ed Dickson, David Paulson, and even the troubled Colt Lyerla and fill-in Johnny Mundt all had big careers or solid seasons with the Ducks; Brown was next in that line. But with Brown out and the Ducks chasing a national title, they needed a replacement. Mundt was a familiar name, but it was Baylis who got the call. Baylis looks the part, standing about 6’6″ and weighing around 250 pounds. Baylis played both linebacker and tight end at Grandview High School in Colorado, becoming an all-league tight end and an all-state linebacker his senior year. 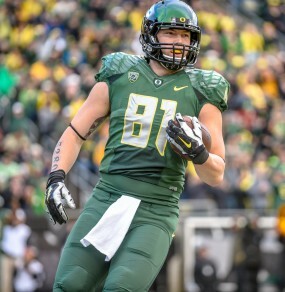 He chose Oregon over Arizona, Boise State, and Colorado and redshirted his freshman season. The next year Baylis caught only four passes for 71 yards in a third-string role, and this season he only had four catches heading into the Rose Bowl. Evan Baylis runs through a Florida State defender after a reception. Then it happened. In the biggest game of the year, Evan Baylis started to make a name for himself. It happened almost immediately, he caught a 19-yard pass to start the Ducks second drive and made two key blocks on the 19-play scoring drive two drives later. Following the FSU fumble to start the third quarter, Baylis had a 30-yard reception to get the Ducks into the redzone, and Oregon went up 25-13 two plays later. Then came the set-up. On third down, Marcus Mariota hit Baylis for a first down. Hurrying up to the line the Ducks ran the same play, Mariota pump faked to Baylis, the defense collapsed on the tight end, and Mariota hit Darren Carrington for a 56-yard touchdown pass. Baylis finished the Rose Bowl with six catches for 73 yards, both career highs. Baylis is big in stature, and now that he has showed up in the biggest game, I’d bet he gained some added trust from Mariota and the coaching staff moving forward. He is an effective blocker in the run game and is now a weapon in the passing game as well. Such versatility could be a match up problem against Ohio State as they might not be focusing on the little known tight end when constructing their game plan. Mariota, Royce Freeman, Thomas Tyner, Carrington and how the defense plays are bigger keys to getting the win, but if the sophomore tight end can replicate, or improve on his Rose Bowl game, he just might just surprise us once again.